The Holker Spring Fair returns for a second year at the historic estate of Holker Hall & Gardens. A celebration of the arrival of spring, the event on the 19th & 20th May is attracting interest from both new and returning exhibitors and confirmed so far is a fine array of all things home, food, garden and gifts. NEW for 2018 visitors will discover Brownthwaite Hardy Plants and Beetham Nursery for all things gardening and outdoor. Gin fans are in for a treat – A selection of gins from Cumbria’s, and possibly the UK’s smallest gin distillery, Shed1 will be available! – Small batch, big gin flavours! For something unusual, Gren’s Shed will be attending with his wild bird feeders and nest boxes made from upcycled household items. Hand made in Gren’s Shed and designed to make your garden quirky and beautiful. Not forgetting the fabulous food with Coco Baroque attending for the first time with their delicious chocolates, bakes and treats and Lakeland Mues, specialist producers of the finest toasted muesli! For gifts and trinkets Ellis & Eliza will be showcasing their handmade colourful and fun embroidered gifts, keepsakes, card stationary, framed art, clothing & accessories. Gates open at 10.30am – 5.00pm. Entry is £3.00 per adult, accompanied children free of charge, and includes parking and entry to the Café, Food Hall and Gift Shop. Finish off your day with… A Spring Evening Barbeque will take place at The Ilex Bar and Brassiere in the Holker Courtyard following the Fair on Saturday 19th from 5pm. A selection of local meats, salad bar and artisan breads will be available. Pre-booking essential. Families welcome. Adults £12.95, children (up to 12yrs) £8.95. 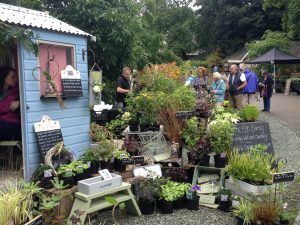 Special offer: Purchase a Hall & Garden ticket online at www.holker.co.uk in advance for the 19th or 20th May and get free entry to the Spring Fair!